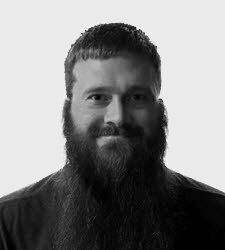 Today, I will try to teach you about the Automation Pyramid. 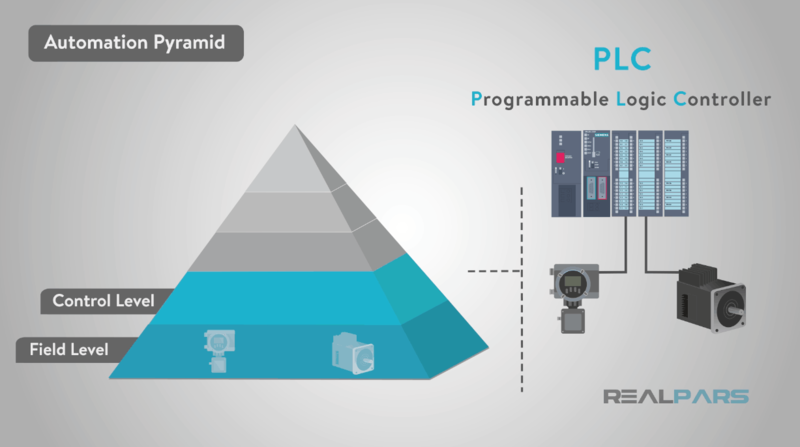 More specifically, the devices used to make up the automation pyramid. 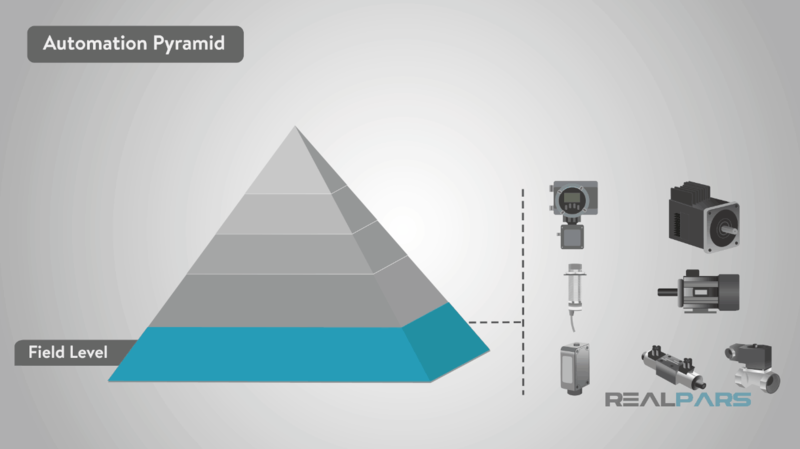 So what exactly is the automation pyramid? It is a pictorial example of the different levels of automation in a factory or industry. It also serves as a visual example of how technology is being integrated into industry. So let’s take a closer look and try to break the pyramid down. Beginning on the bottom of the pyramid is what we will refer to as the “field” level. These are the devices, actuators, and sensors that you see in the field or on the production floor. If you think of it this way, the field level is the production floor that does the physical work and monitoring. 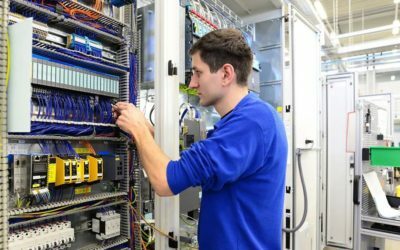 Electric motors, hydraulic and pneumatic actuators to move machinery, proximity switches used to detect that movement or certain materials, photoelectric switches that detect similar things will all play a part in the field level. The next level is referred to as the control level. This is where the PLC’s and PID’s come in to play. The control level uses these devices to control and “run” the devices in the field level that actually do the physical work. They take in information from all of the sensors, switches, and other input devices to make decisions on what outputs to turn on to complete the programmed task. 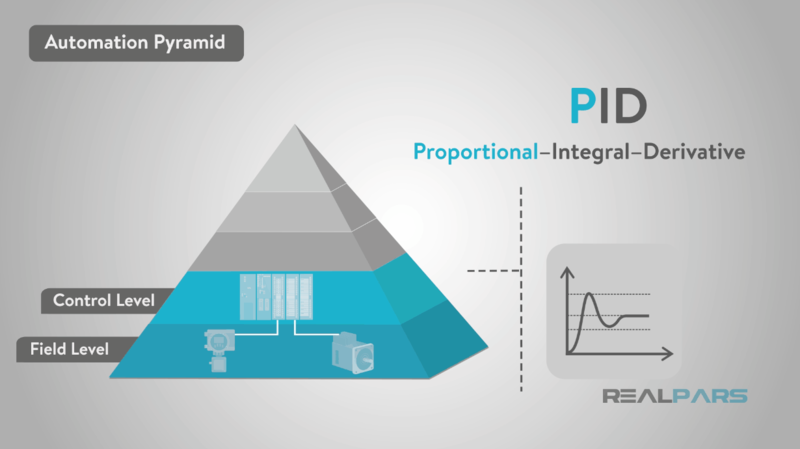 A PID is usually integrated in to the PLC and stands for proportional–integral–derivative. That is what can keep a variable within a set of parameters. A common example that you probably use every day is your cruise control. 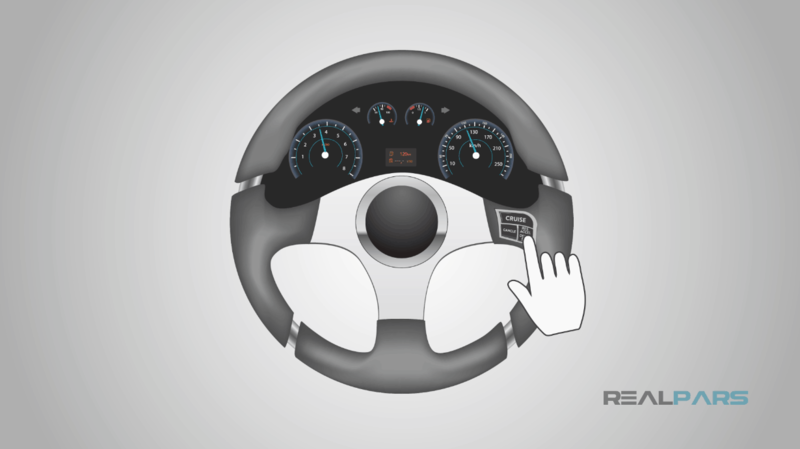 You set your cruise control to whatever speed you want, then a set of sensors and the computer in the car will tell it when to accelerate or decelerate according to the set speed. A common industrial PID controlled item is a heater. 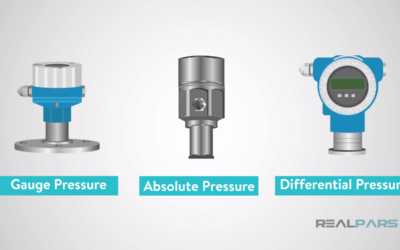 Many systems in manufacturing plants have to be heated. We control this with a PID block within the PLC. 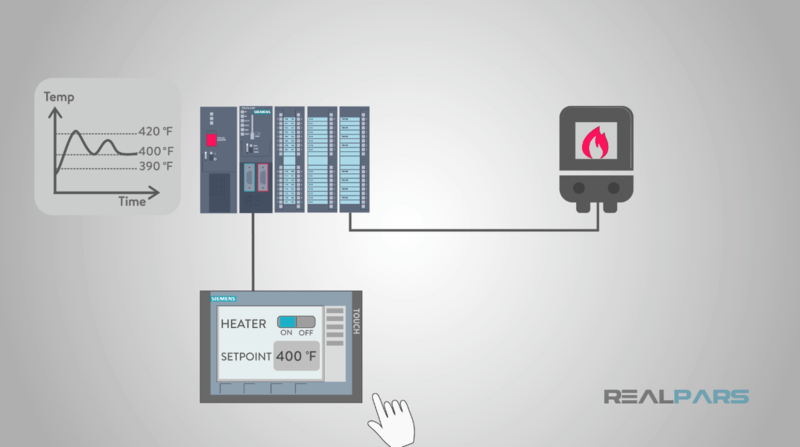 When a set point is entered, the PID will determine when the PLC needs to turn the heater on and off to maintain a constant temperature. 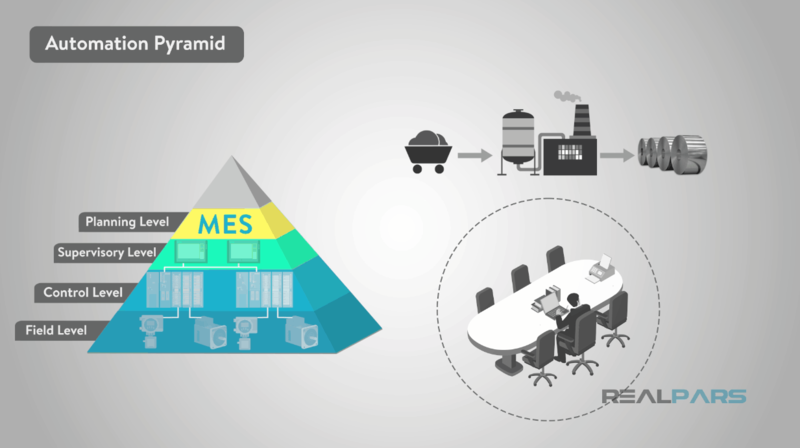 The third level of the automation pyramid is known as the supervisory level. 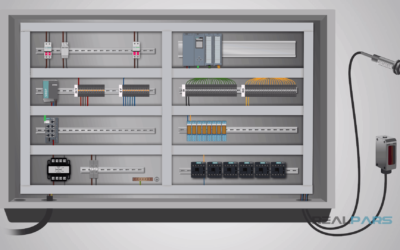 Where the previous level utilizes PLCs, this level utilizes SCADA. 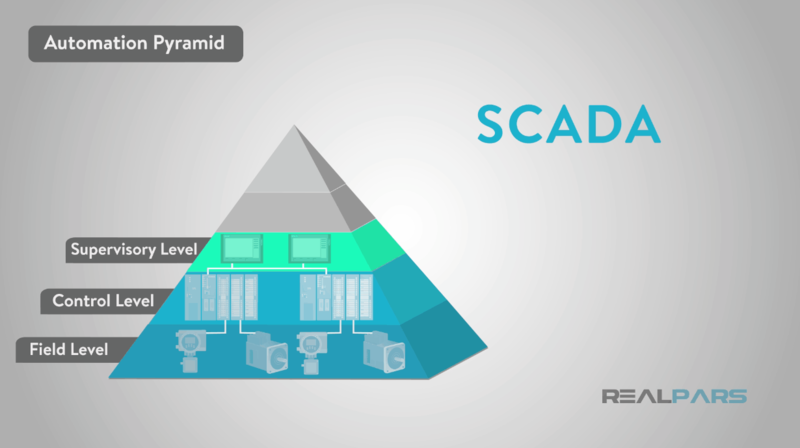 SCADA is short for supervisory control and data acquisition. SCADA is essentially the combination of the previous levels used to access data and control systems from a single location. Plus it usually adds a graphical user interface, or an HMI, to control functions remotely. Water plants will often employ this technology to control remote water pumps in their systems. 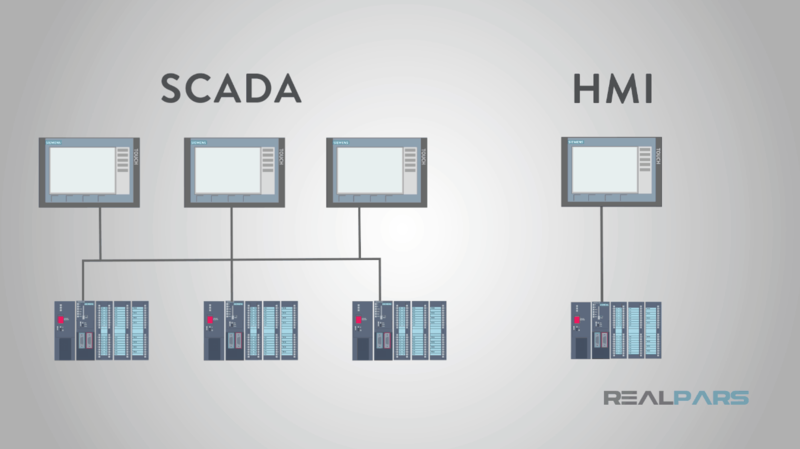 The important thing to remember about SCADA is that it can monitor and control multiple systems from a single location. It isn’t limited to a single machine like HMI’s that we have discussed in previous posts. The fourth level of the automation pyramid is called the planning level. 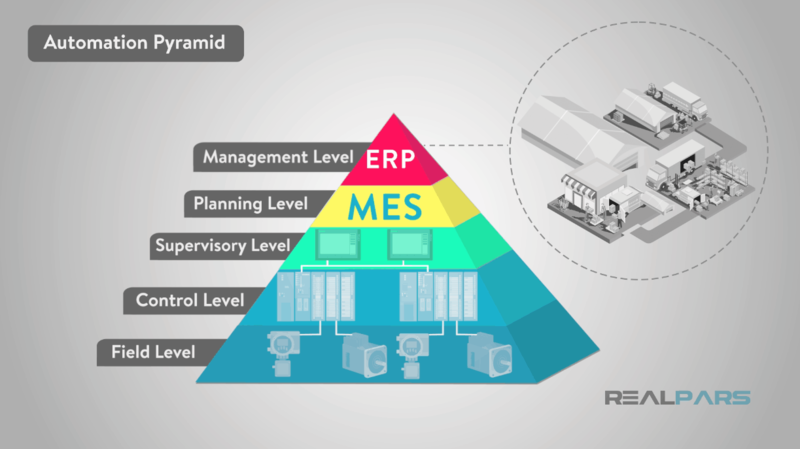 This level utilizes a computer management system known as MES or manufacturing execution system. MES monitors the entire manufacturing process in a plant or factory from the raw materials to the finished product. This allows management to see exactly what is happening and allows them to make decisions based on that information. They can adjust raw material orders or shipment plans based on real data received from the systems we talked about earlier. The top of the pyramid is what is called the management level. 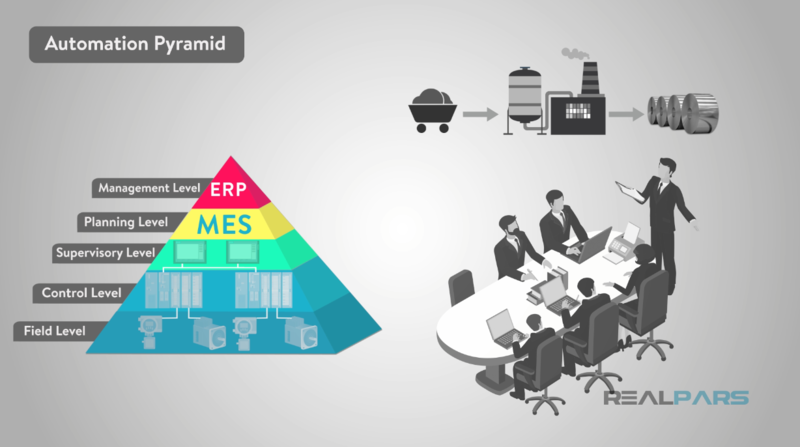 This level uses the companies integrated management system which is known as the ERP or enterprise resource planning. This is where a company’s top management can see and control their operations. ERP is usually a suite of different computer applications that can see everything going on inside a company. It utilizes all of the previous levels technology plus some more software to accomplish this level of integration. This allows the business to be able to monitor all levels of the business from manufacturing, to sales, to purchasing, to finance and payroll, plus many others. The integration of the ERP promotes efficiency and transparency within a company by keeping everyone in the same page. So let’s see what you have learned about the automation pyramid. When you start at the bottom, you are starting on the production floor with all of the sensors, motors, and actuators that make the facility run. As you move up the pyramid, the next level is for controlling the field level. This is where the PLCs and PIDs come in to control the devices at the field level. The next level is the SCADA controls. These are great for controlling and automating large areas or over long distances. The last two levels are mostly for management. One to control a single plant, the last that can monitor an entire company inside and out. I truly hope this gave you a little information on the automation pyramid and how technology is automating industry. Make sure you check back for another new blog post soon. Thank you so much for taking part of your day to be here. Leave a comment to let us know what you think and make sure to subscribe to our newsletter to get the latest content first.